Frame drums and Bodhrans are great in so many ways. No matter if you are a musician who wants to expand his playing, or you need something for fun, these are the instruments you definitely have to check. Affordable price and interesting look would also make all kinds of frame drums a nice addition for everyone who needs an interesting detail to decorate his living room or apartment. The secret in their popularity is in the ancient flavor. 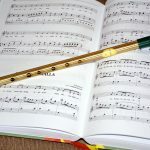 As you probably know, percussion instruments were probably the first instruments that appeared in the history of mankind (after the human voice). First frame drums appeared thousands of years ago and there are so many kinds of these instruments around. Basically, everything that has a drumhead width greater than its depth is considered a frame drum. So, it’s no wonder that so many cultures around the world have their own unique kinds of frame drum. 1. Remo HD-8510-00 Fiberskyn Frame Drum, 10"
6. 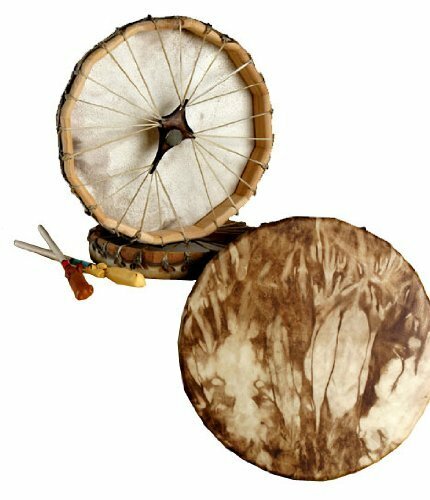 Native American, Deer Hide/Walnut Stained, Frame Drum 10"
In Nordic countries and Russia, there is an instrument called Sami drum. In England, you can find a traditional folk instrument known as Riddle drum. In the Middle East, there are various types of frame drums as well. Some of the most common are Riq, Tar, Bendir etc. Lag-na is a traditional Tibetian frame drum, while Yike is played in Cambodia. Pretty much every country has its own kind of a frame drum. 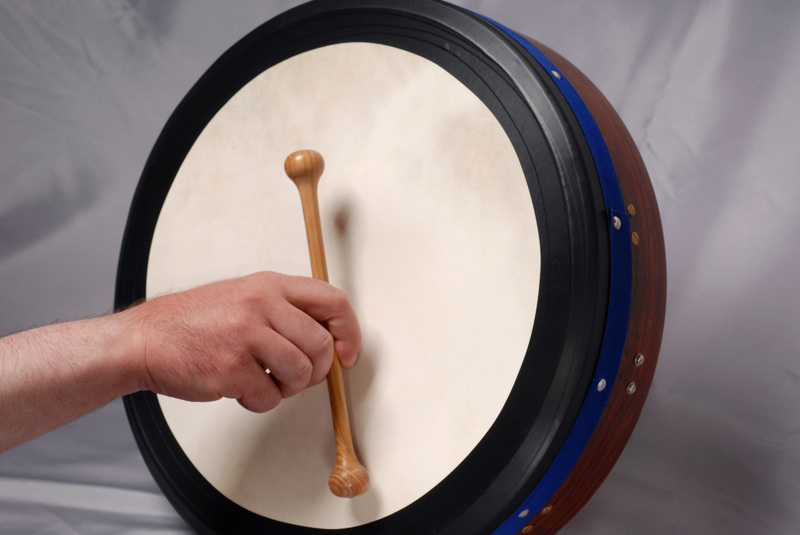 One of the most interesting types of a frame drum is Bodhran. 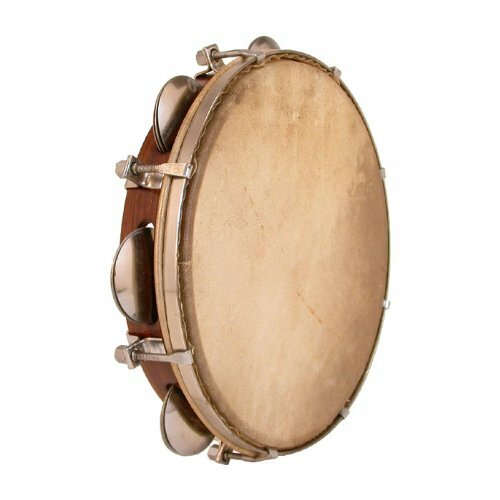 This instrument is a traditional Irish frame drum. It dates from ancient times and definitely had a strong influence on Celtic music. So, it’s no wonder that its popularity goes beyond Irish borders in these days, when Celtic music has expanded across the Globe. The most common thing for all frame drums is its simple construction and use of natural materials. 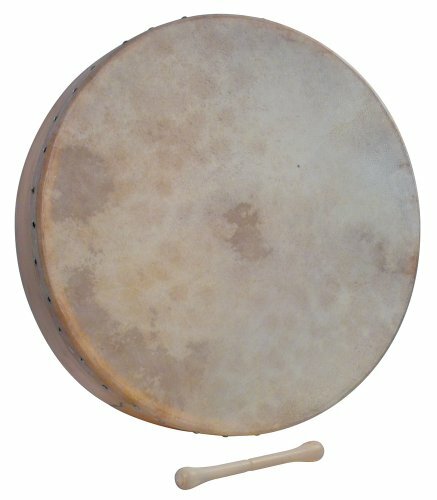 The drumhead is usually made of rawhide materials, predominately leather. On the other side, the shell is made of wood. A bent wood is usually scarf jointed together. Of course, in these days of mass production, materials like plastics and synthetic leather are used as well. 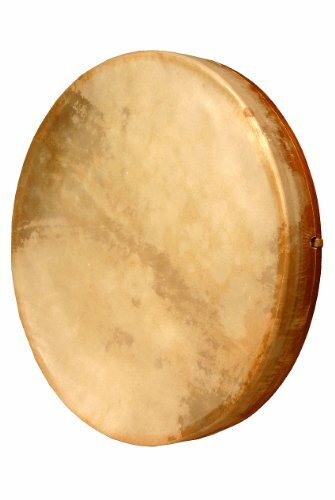 Bodhrans usually feature a goatskin drumhead, though modern ones could be made of synthetic leather. Also, many of them feature mechanical tuning systems in these days, so you can tighten or loosen the leather, in order to get the best sound quality, no matter the weather and atmospheric conditions. If you think Frame Drums and Bodhrans are basic instruments then you need to watch this video. The drum patterns may be easy to learn, but the mastery of them is extremely impressive! 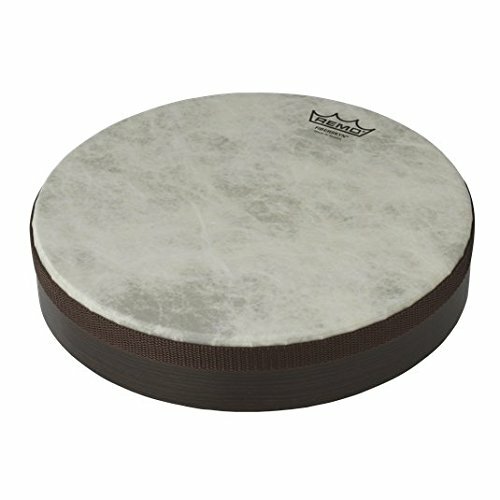 If you are looking for something super-affordable, but still of a decent quality, here is the frame drum for you. The Remo Fiberskyn Frame Drum comes in various sizes. This one is among smallest and features 10 inches in radius. You can choose everything from 8 to 22 inches. Compact dimensions are highly beneficial, but the thing that makes this instrument one of the most popular products of its kind is convenience. This drum is made mostly of synthetic materials, which is expected, considering the price. Still, it comes with some pretty nice features. First of all, it is pre-tuned and delivers pretty warm sound, no matter if you like to play with your palm or a mullet. A great balance between the price and quality makes this frame drum perfect for beginners. In these days when most frame drums and bodhrans are made of synthetic materials, products like this one are highly appreciated. Not only that this bodhran is almost completely natural, but it also looks like it comes from several centuries ago. You can count on things like a real goatskin drumhead, as well as on a laminated wood rim. It features 18 inches in diameter and also features a twin crossbar for additional sturdiness. Such a combination provides genuine bodhran tone. The product weights around 3 pounds, while only 3.5 inches in depth make this frame drum portable and very comfortable to use. Considering all the qualities, I would say that the price seems very affordable. You get what you pay for! So, if you want to spend a little bit bigger amount of money, in order to get a hi-quality bodhran, here is the product for you. This one is made completely of natural materials. A quality goat leather for the drum head and a rubberwood frame. It actually comes in two variants – Celtic and Irish. This one is an Irish Bodhran, which comes with a deeper frame that provides a richer sound. You can count on 6 inches of depth, while the drumhead features 14 inches in diameter. Also, a nice addition is a dampening layer around the rim, which will keep your playing safe from too many overtones. All in all, a high price tag, but high quality as well. The price might seem high to some, but this frame drum offers lots of qualities. First of all, there is an amazing visual appeal. This one looks like it came directly from several centuries ago. It is a handcrafted drum, with the head made of goatskin and quality wood frame. It also comes with a rustic-looking mallet, which is made of wood and quality fabric for its head. Besides amazing tonal characteristics, another strong point is its weight, which goes around 1.6 pounds only, which sounds amazing, considering that the drum features 22 inches in diameter and 4 inches in depth. You definitely won’t go wrong with this one. Pandeiro is definitely one of the most interesting frame drums you can find around. It originates from Brazil. 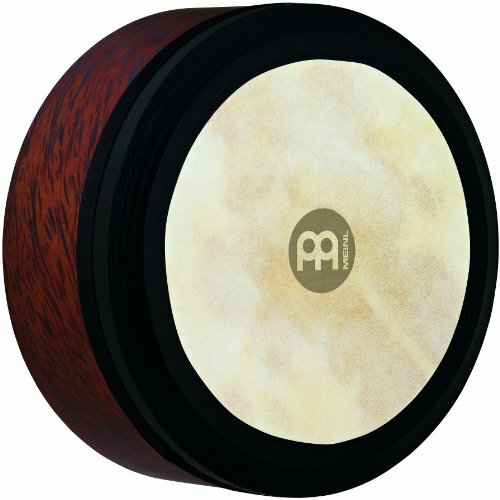 So, if you want to add a bit of a samba flavor to your playing, go for a percussion that many see as an unofficial instrument of South America’s biggest nation. Interestingly, this product is made in Pakistan. It might sound strange to see a pandeiro from a completely different part of the world, but Pakistan is the country where you can find some of the finest pieces of goatskin. The frame is made of quality wood, while seven pieces of steel jingles make this instrument highly versatile. The goatskin is tunable and tuning tool is also included. Just like all cultures from around the world, Native Americans also have their version of a frame drum. This particular product closely resembles frame drums that have been used in North America for ages. The choice of materials and look are the things that make this drum so distinctive. The product is hand-crafted and it is made from cedar wood and deer hide. Also, there is a beautiful walnut-stained finish, which makes this frame drum, not just a great instrument, but perfect decoration detail as well. A mallet is also included. A frame drum, or particularly bodhrans, would be a great purchase for everyone who plays or just love percussion. These instruments date from the ancient times and perfectly represent a specific culture or part of the world. As it was mentioned above, there is a huge number of different types of frame drums you can get on the market these days. Just determine your budget and keep in mind cultures you like or you’re interested in, and the choice should be easy. Also, keep in mind that these instruments would be a perfect birthday or Christmas present. 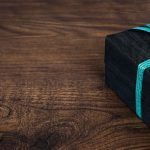 These products are usually affordable and attractive looking, so even if you don’t play, it is a great thing to hang it on the wall of your room.